It's not often that dreams come true. 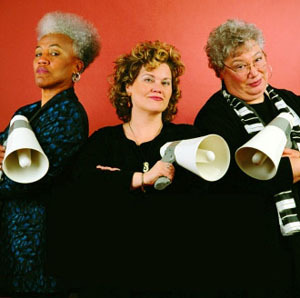 In the case of the acoustic blues trio, Saffire--The Uppity Blues Women, that's just what happened. Over the course of nine recordings and thousands of gigs, the group has gone from virtual obscurity to one of the most popular, witty, and just plain satisfying acoustic blues groups on the scene today. These women tear into their material with passion, dedication, and originality. Every song they cover becomes theirs, and their originals blend seamlessly with their interpretations. They are indeed the torchbearers for the original classic uppity blues women like Bessie Smith, Sippie Wallace and Victoria Spivey.